The Long Term Care Insurance Partnership program is a state program that encourages people to buy Long Term Care Insurance in exchange for a possible Medicaid spend down requirement waiver if you were to need care. There is no additional cost for Long Term Care Partnership Benefits. The states require you purchase inflation protection, but that is already part of any good Long Term Care plan already. In California, you are required to purchase $180/day benefit minimum – virtually all other states (except NY/CT/IN/Mass) have no such requirement. Your policy must be a state approved Partnership plan (ask your LTC Tree agent for details) and depending on your age must have either compound or simple inflation protection. This is a state-by-state specific issue, so having a knowledgable agent is key. While about 15% of clients will opt for an unlimited benefit period, the existence of the Partnership plans makes it possible for you to possibly purchase less coverage closer to the average risk knowing that if your claim lasts longer than average, you may have asset protection thanks to your LTC Partnership policy. Why are the states doing this? We don’t want to overstate the actual utility of the Long Term Care Insurance Partnership Program for the average consumer because the States know that 92% of Long Term Care claims are for 3 years or less. This statistics reveals that most people simply do not use up their Long Term Care Insurance benefits, so if the state can encourage personal responsibility, it will save already heavly strained Medicaid program money and help the states stay solvent. The bottom line is, state Partnership Plans are nice safety net to have in your Long Term Care plan, but odds are you’ll never have to fall back on it. The state actuaries are aware of this, so we expect Partnership plans to grow rather than shrink as state budgets tighten. Currently, these programs operate in most states. More on that below. Because Americans tend to move. 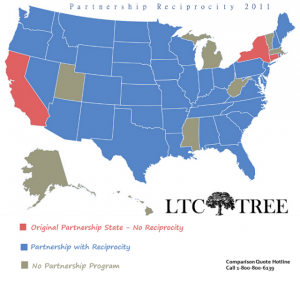 The “original four” LTC Partnership states were California, Connecticut, Indiana, and New York. Because these states have had programs for a while, below are some statistics that provide an actuarial idea of how likely one may be to exhaust a policy. Hint: not as likely as you might think. Source: Government Accountability Office, 2005. The Deficit Reduction Act of 2005 (DRA 05) now allows all states to create Long Term Care Insurance Partnership Plans. Most states have jumped on board or are in the process of designing the plans. Partnership policies in these new programs must meet specified criteria, such as federal tax-qualification, identified consumer protections, and inflation protection provisions. We have written about various states as they have come online over the years. This list is a work-in-progress, however, so all participating states may not be listed. Links that are in blue are states that we have written about before. At LTCtree.com we keep up with the progress of each state’s Long Term Care Partnership Plans and will be happy to help you sift through the government red-tape. There are some true advantages to having a Long Term Care Insurance Partnership plan. To get your own quotes and comparisons, simply complete our form below.